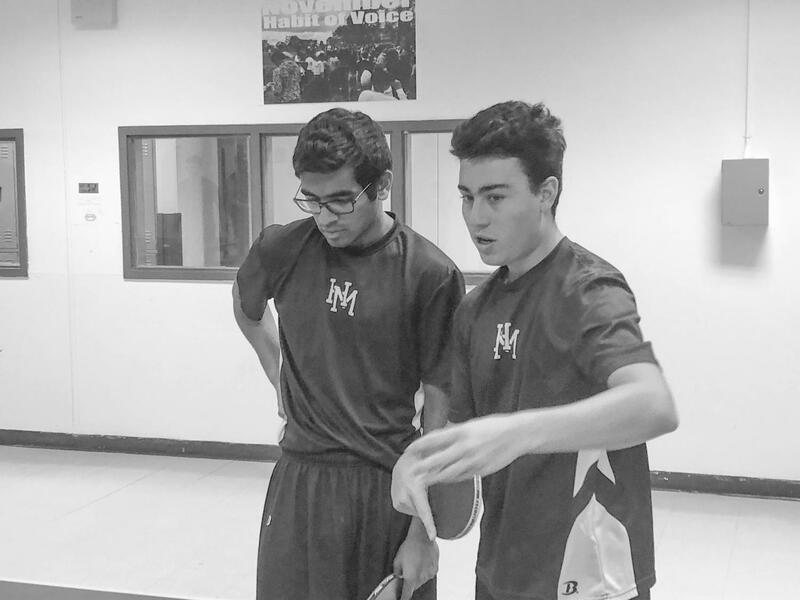 Members of the Varsity Table Tennis team rip the ball across the court with laser precision. The team has thrived with excellent play in its inaugural season, sporting a 2-2 record. Captain Robbie Werdiger (11) started a ping pong club that met during I periods last year. “We played recreationally with hard paddles and bad equipment,” Werdiger said. However, after two exciting matches last year, Athletic Director Robert Annunziata and Werdiger created a league and convinced Fieldston, Leman, and Kew Forest to join. “We are grateful for the school’s administration providing us with the means to start a table tennis, team” Varsity Table Tennis Coach Caroline Surhoff said. “A lot of students don’t know we are a team and are generally surprised to hear so,” Werdiger said. Werdiger has attempted to garner interest for the new team by writing a Record opinion that was published last year, he said. Aside from a small roster, the team has faced various other challenges as well. “We got new paddles and balls, only a week ago” Leonardo Hess (9) said. In addition, the team’s training facilities are not ideal, as they usually practice in the basement of Lutnick Hall, Werdiger said. Practices, which are typically an hour and a half, start with rallying drills and end by playing points, Malhaar Agrawal (11) said. “We Instagram Live our practices for others to watch,” Agrawal said. The team attended two training sessions with a table tennis champion from Togo, Africa. “He taught us how to serve, hold the racket, and stand,” Aneesh Bafna (11) said. “Our coaches have mentored and taught us, and have helped us be better ping pong athletes,” Agrawal said. “We have made strides in improving our skills and technique, and gained playing experience,” Surhoff said. “We have enthusiastic team members motivated to succeed,” Surhoff said. Games consist of three singles and two doubles matches that are each best of five sets. The team plays home matches in the wrestling room or the gym. “The atmosphere is light-hearted because it’s ping pong’s first year, ” Hess said. “We have a tight knit group of four juniors and four freshman,” Agrawal said. Sometimes the more advanced players will give advice on strategies and teach the teammates how to serve as well, Hess said. The team hopes to compete in the League championship tournament at Horace Mann on February 21-22, Surhoff said. “We are technically playing as a startup program or club team, but with sustained program interest will function as an official varsity sport next year,” Surhoff said.